JUDY WOODRUFF: Next: this year's Nobel Prize in physics. The owner was shared today for work done with high-intensity light. Those breakthroughs eventually led to practical applications used today. And it includes sharing the award with a woman for the first time in 55 years. Amna Nawaz has our conversation. AMNA NAWAZ: The Nobel Committee awarded the prize to a trio of scientists. Arthur Ashkin of the United States invented so called optical tweezers, highly focused beans that can manipulate microscopic objects and organisms. Gerard Mourou of France and Donna Strickland of Canada together developed a method to intensify laser beams in short pulses, which led to a number of applications, including laser eye surgery. 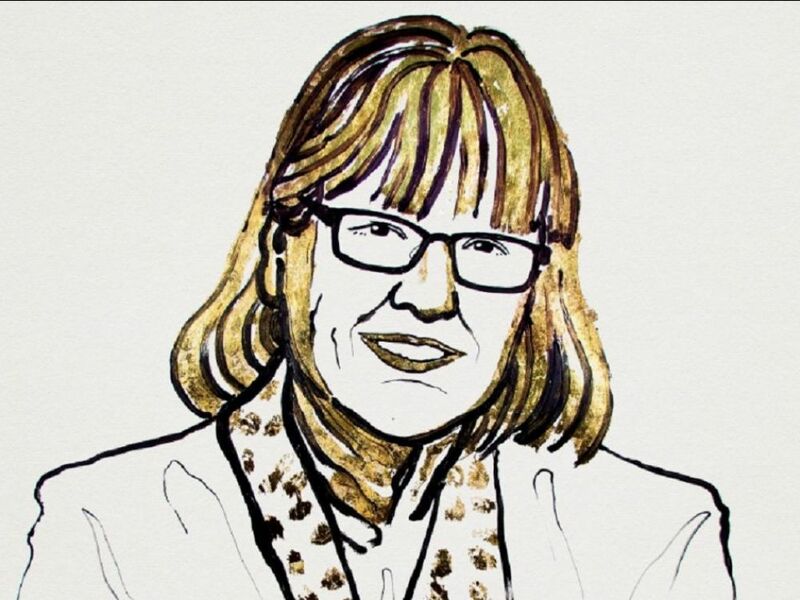 Donna Strickland is just the third woman in history to win a Nobel in physics. And she joins me now. Dr. Strickland thank you for being with us. And congratulations. I should point out that method you developed was with Dr. Mourou, with whom you share the prize. You did that research back when you were a graduate student. Did you ever imagine that work would lead to a Nobel Prize? DR. DONNA STRICKLAND, Nobel Prize in Physics Winner: Certainly no, not when we were working on it. We did know it was probably going to be important work. But I don't, it's a rare thing to get a Nobel Prize. AMNA NAWAZ: It is rare indeed. And we have to ask this. What was that moment like when you first got notification that you had won that prize? DR. DONNA STRICKLAND: Well, of course it is at 5:00 a.m. So you are barely thinking, but at least for me. It was surprising. It's one of those things that you can't really believe is happening to you. DR. DONNA STRICKLAND: Both my husband and I were there going, oh, my goodness. AMNA NAWAZ: That work that we mentioned earlier, it has everyday applications now. Laser Eye Surgery is one a lot of people might be familiar with. Where else can people see that work in practice around them? DR. DONNA STRICKLAND: I don't know that they would see it in practice around them any other place. I think that's the one application that goes right to the public. There are laser machining applications and other things than just the eye that uses it. But that would be carried out in certain industries. And much of the work that's being done around the world is still in research labs. AMNA NAWAZ: We mentioned as we introduced you. You're only the third woman ever to win the Nobel Prize in physics, the first woman in 55 years to do so. Let me put this to you. Why do you think that is? Why don't want more women share that honor? DR. DONNA STRICKLAND: Well, again, I don't really quite know. But, of course, when I was doing my Ph.D., there were only about 10 percent. If I went to a conference, it would only be about 10 percent women. That said, obviously, why didn't women at least get it every 10 years? I don't know. It's one of those things. But I think things keep changing, and for the better. So I'm sure we will see more as times goes on. AMNA NAWAZ: To that point, as you have worked in this field, as you have come up through it, have you seen things changing? Have you seen things get better? It's a field that women are sorely underrepresented in. DR. DONNA STRICKLAND: Well, obviously, it's getting better. I mean, the last woman who won it was Maria Goeppert Mayer. And she didn't get paid for most of her career to do her science. So I cite her in my thesis from work she did in 1939. But I believe it was the '50s before she got paid. So she was getting paid to be a scientist before winning the Nobel Prize. But it's amazing to me that, as a woman, she wasn't considered to be worthy of even paying as a scientist. That's changed. Obviously, I have always been paid, like my male counterparts. I have never felt that I wasn't being treated equal. So things do keep changing. AMNA NAWAZ: They do indeed. I should ask you now, as you are giving interviews, being celebrated for your work, you have a chance to send a message now to millions of other young women out there who might be interested in pursuing a career in a similar field. What would you say to them now? DR. DONNA STRICKLAND: I would say the same as I would to a male or female. You should always be doing something that you want. If you want to do it, put blinders on and just do it. Don't ever let anybody else tell you that you shouldn't do it. It's, I think everybody knows themselves the best. And listen to yourself, and just go for what you want. AMNA NAWAZ: So, you're obviously sharing your work and being celebrated today. How does a Nobel Prize winner actually celebrate once you learn you have won that award? DR. DONNA STRICKLAND: Well, my husband contacted the local restaurant critic and asked where he should take his wife out for dinner. So we're going to the nicest restaurant, according to the critic. And that's where we celebrated our 10th wedding anniversary. So now it's going to be for the Nobel Prize. So, that's what we're going to do tonight. AMNA NAWAZ: Enjoy the meal, and enjoy your prize. DR. DONNA STRICKLAND: Thank you. AMNA NAWAZ: Congratulations to you, Dr. Donna Strickland. Thanks for making the time to talk to us. DR. DONNA STRICKLAND: Thank you very much. Most people are familiar with this figure from Wagner's opera. Our 10-page guide will help you to change your life for the better. Two significant constants have been found in a number of research studies. They regard the problem as not worthy of serious consideration.